With island flooding washing it out of its planned return to Artscape Gibraltar Point, this year's Camp Wavelength became the "Day Camp in the City" edition, demanding some doubled down, extended improvisation. 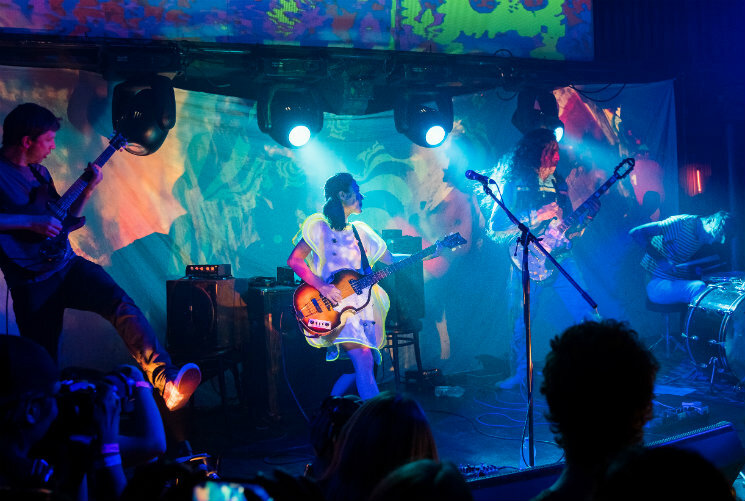 So what better to cap it all off than the artfully noise-riddled pop explosion that is Deerhoof? Spilling out in tight fits of rhythmic euphoria, their bombastically coloured, career-spanning set made the basement space of Longboat Hall feel ceilingless, fresh cuts from their forthcoming Mountain Moves like the Bob Dylan heckling inspired "Come Down Here and Say That" (already dramatically reworked from the keyed up single, which features Stereolab's Lætitia Sadier) taking on extra resonance in the face of disappointed island hopefuls. Island or no, this year's camp delivered. And in an encore performance, Deerhoof placed the crowd under the heavens anyway, as bassist Satomi Matsuzaki pantomimed the impending total eclipse of the sun, her tiny figure comically blocking out a (very) hunched Ed Rodriguez as she shuffled along the path of totality of the stage. So, yes: as drummer Greg Saunier so eloquently put it in one of his longwinded asides, "an additional and special and more elaborated and detailed thank you [to Wavelength] in this particular case, because of the extremely high degree of fun."